Vase with Spring flowers (1975) by me! Yesterday I happened to find some of my own old school stuff: two small project/drawing books from Kindergarten and one little writing book from first grade. Actually that's about all there is left my school things and I'm rather glad there isn't much more! I hope my girls will feel the same in 30 years time because I'm quite determined to only save a selection of their drawings and school work. If anyone has a good tip on how to select from the big heap of stuff that doesn't include making photos of the drawings (because that's creating a whole new problem) than please let me know! Tenho muita coisa também,mas tudo garimpado.Como?Os livros doei para biblioteca local(serve para pesquisa).Guardei as provas mensais e todos os desenhos das minhas filhas em um baú de idade com muito cravo da índia(evita traças e outros).Guardei também os uniformes escolares,um só de cada ano,em um saco que puxa o ar com aspirados de pó,não sei o nome nem a marca,mas veio da USA.Os brinquedos,pedi para escolherem os mais queridos e a sobra foi para a creche.Não se pode esquecer que legos tem o poder de multiplicação,a trinta anos eu junto em um barril de carvalho que era do meu avô.Roupas de batizado,primeira comunhão, desfiles de 7 de setembro,etc..está também em um saco destes.As outras roupas foram passando de uma para outra e depois para os que chegavam,primo as mais novas ou mais magras.As minhas parafernálias ficam em pastas plásticas no quarto de costura,revistas eu não tiro páginas,dobro na que eu gosto ou que tenho plano de fazer um dia.O ideal é por etiquetas em tudo e não ficar mudando de lugar,se não....Será que tá bom? tenho mais a falar kkk Beijos e Bençãos.Ps:tradutor com confusão é normal. Esqueci....Vejo uma linda colcha neste desenho,vamos? My daughter is 25 yrs old. I kept some of her stuff and some I didn't.You will be glad you kept it that is for sure. This year for her birthday, I am taking one item from each year, plus the ultrasound picture they did before she was born, and having them put in a real BOOK. It will have all her little drawings up to her senior year in high school and then college. You upload everything to Snapfish, choose your book style and layout, put captions for each page adn low and behold you get a real BOOK back in the mail. AMAZING! 26 years in ONE book. Pretty Cool! Hope this helps. That sounds like a fabulous gift! 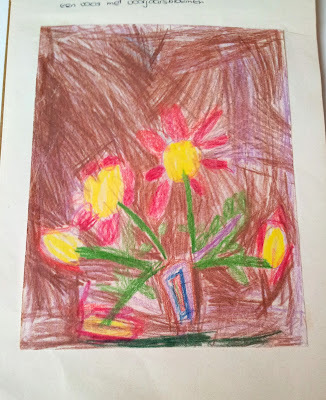 I kept my 3 kids' drawings and cards and anything "artsy", and I'm sure glad I did. They are all grown up now, and still love going through those boxes every few years. My oldest son is an artist, and he loves the fact that I saved his very first drawing, when he was 3. Priceless. I will, however, make 3 scrapbooks for them, with some of the best stuff. It's on my to do list! I think my tip is to only save the best/most special stuff, which is probably exactly what you are wanting to do, only I'm saying that you don't have to worry about HOW, because once you start looking through the stuff it is totally obvious which things are special.